It starts out innocuously-enough. You approach Disneyland‘s “it’s a small world” mall in the morning hours and see some uniquely decorated wreaths hanging throughout the mall. Nice holiday touch. Then, you approach the attraction and notice a “Happy Holidays” sign affixed to the normal marquee. Cheerful holiday spirit. Then, you head through the queue, and begin hearing a “remix” of the standard “it’s a small world” song, with holiday tracks woven in. Why no Neil Diamond, you wonder in outrage?! Then, you board your boat and enter the attraction. The holidays begin to inundate your senses. Here is precisely when you realize that “holiday overlay” at Disneyland means something wholly different at Disneyland than it means at Walt Disney World. At the latter, it means adding Santa hats to animals and some chocolate smell to an African-inspired afternoon parade and calling it a day. At Disneyland, it means reimagining an attraction and using the basic infrastructure in place to create an experience that’s almost entirely new. Explaining the excellence that is “it’s a small world” holiday via text is like trying to demonstrate how delicious filet mignon is by having Jackson Pollock make a painting of the meat. Both are ineffective. 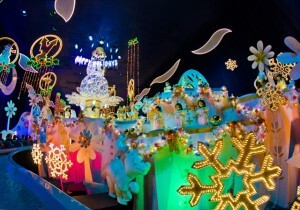 I would advise you to view photos or watch a ride-through of “it’s a small world” holiday, but if you’ve never seen the attraction and someday plan on seeing it, you’re far better off experiencing it for the first time in person. That’s what we did and I’m thankful we chose not to spoil it for ourselves by watching video in advance. In lieu of a better alternative, I’ll offer a bit in the way of prose explanation. The entirety of the inside of the attraction is transformed, with Christmas trees, holiday archways, representations of different Christmases (Elvis even makes an appearance! ), New Years, and other winter traditions. Lights abound throughout the inside of the attraction, and every scene gets in the holiday spirit in its own unique way (no simple Santa hat on our friend the hippo here!). You’ll see Christmas under the sea with Ariel and friends, Christmas on the American frontier, Christmas in Europe (my favorite scene), winter at the North Pole, and even the Chinese New Year! The finale room might be the most impressive, and its focal point is a new-for-2011 giant snowflake-covered snowman who holds a “Happy Holidays” sign. Obviously, since “it’s a small world” celebrates different customs and traditions throughout the world, this is truly a holiday attraction, and doesn’t just add the neutral holiday tag for politically correct purposes. The attraction really offers something for everyone, and even the most cold-hearted curmudgeon should enjoy it. 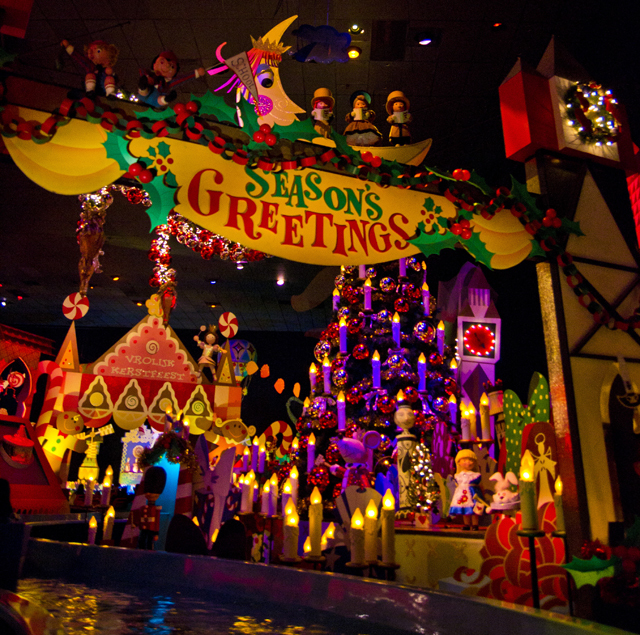 In addition to the attraction’s veritable feast for the senses, there are holiday scents inside “it’s a small world” holiday that might make you question whether you’re experiencing “it’s a small world” or Soarin’! These scents include pine tree and peppermint in the European scenes. Suffice to say, the overlay is nothing short of jaw-dropping. Speaking of jaw-dropping, it’s worth making a trip over to the “it’s a small world” mall at night. 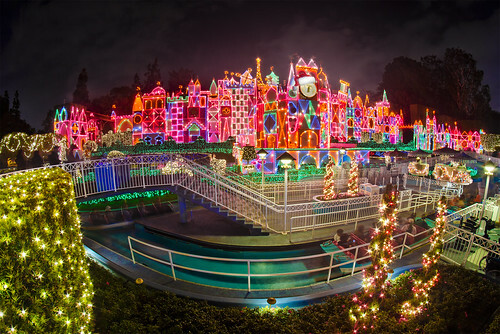 You’ll be blown away as 50,000 C-7 lights in 6 colors, an additional 2,000 clear flashers, and 200,000 mini-lights in the trees, topiaries, and shrubs around the “it’s a small world” mall make the holidays bright. This staggering number of brilliant Christmas lights would make even Tim “Toolman” Taylor blush! In addition to that, a neat multimedia show plays on the facade every 15 minutes, and the Magic, the Memories, and You! includes a nice holiday segment. 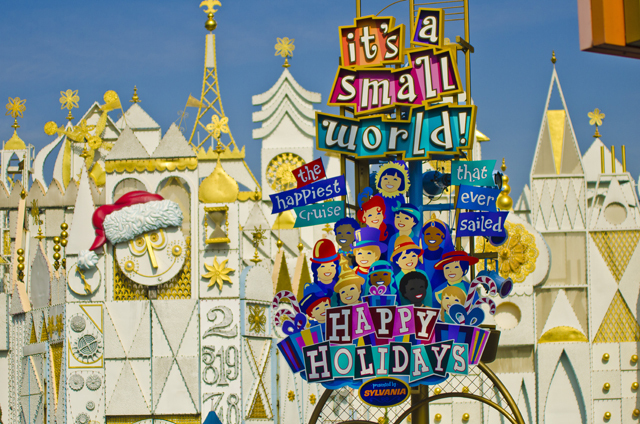 Despite all of my gushing over “it’s a small world” holiday, it’s not even the most intricately reimagined holiday overlay at Disneyland. That distinction goes to Haunted Mansion Holiday, and by a large margin. I’m not even a Nightmare Before Christmas fan, so while I was enthused to see a new attraction, I wasn’t jumping up and down at the prospect. That said, Haunted Mansion Holiday absolutely blew me away. Anyone who enjoys fun will absolutely love this overlay of the Haunted Mansion. It might be cliche to say one attraction is “worth the trip alone.” In which case, these two attractions together easily make it worth the trip to Disneyland at Christmas. The upside is that, on top of these two attractions, you’ll also get to see Santa’s Reindeer Round-up, World of Color: Prep & Landing, “Believe… In Holiday Magic” Christmas fireworks, “A Christmas Fantasy” parade, the best Christmas desserts on the planet, and oodles of Christmas decorations throughout Disneyland. (Check out my time-lapse video for a whirlwind tour of Disneyland at Christmas!) 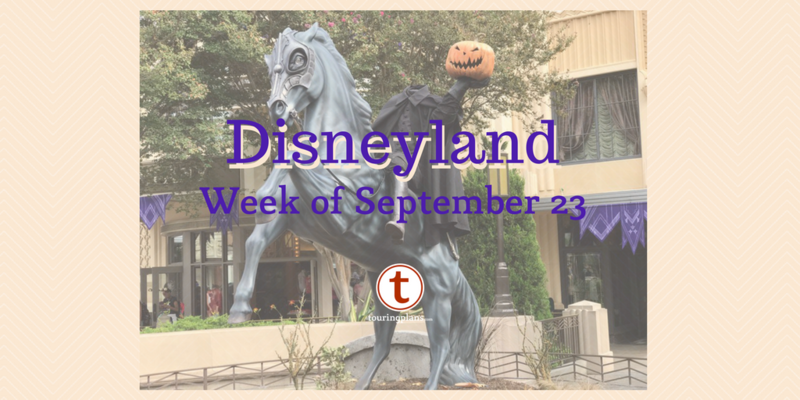 Plus, since you probably won’t be booking a spontaneous trip to Disneyland within the next couple of weeks solely on the basis of this blog post (although my words really ought to be that impacting on you! ), you’ll also get to see Disney California’s Buena Vista Street all decked out for its first Christmas next year! 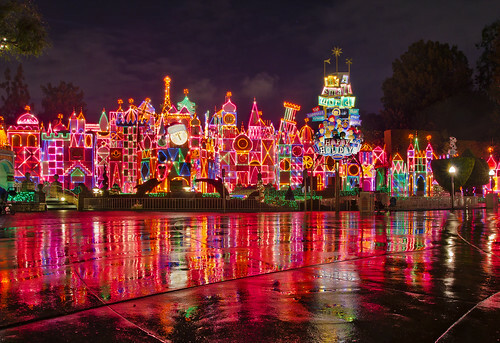 …So, have you booked that Disneyland Christmas trip yet?! 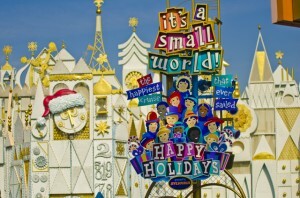 Have you experienced “it’s a small world” holiday? What did you think? Is it every bit as amazing as I described, or are you a Grinch? If you haven’t experienced it, are you hoping to take a trip to Disneyland at Christmas so you can do Christmas, Disneyland-style? Let us know your thoughts in the comments! Tom is an amateur Walt Disney World photographer. He recently married his princess, Sarah, to whom he became engaged at WDW on the beach of the Polynesian Resort in 2007. Tom and Sarah have a miniature dachshund named Walter E. Dogsney and a yellow cat named Yossarian the Cat. Together, Sarah and Tom run the website http://DisneyTouristBlog.com. Tom's photography can be found on his Flickr page (www.flickr.com/tombricker) and he can be contacted via Twitter (@wdwfigment) and Facebook (www.facebook.com/wdwfigment). That’s it! Christmas at Disneyland in 2012. But since the world is going to end before Christmas, maybe for Reunion2012, we should schedule an event to fly out to Disneyland just as Reunion at WDW ends. Any takers? I loved the holiday overlay for this ride. The decorations were lovely, and the songs were a welcome change from just the regular song. I am so glad that I got to experience this during our recent Disneyland Trip. I also enjoyed the Haunted Mansion Holiday. I can’t wait to go back to Disneyland again. Thank you a bunch for sharing this with all of us you actually know what you’re speaking about!